this is one of my favourite bowls of pasta to sit down to. 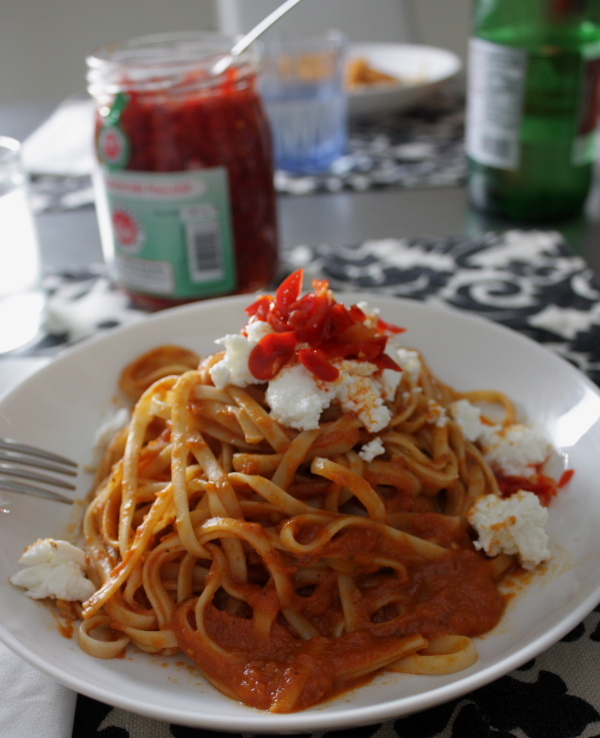 a slightly sweet and tart pureed tomato sauce, on linguini (it calls for a slurpy noodle if you ask me, and spaghetti is just a little too wispy for this), with creamy ricotta and chilies in oil. i do not dare wear white when eating this, but no other rules apply. i eat this fast, go for seconds and scrape the plate, every time. yum. We have similiar tastes, sometimes its the simplest things. I have a tried and true pasta dish which is essentially just pasta and roasted cherry tomatoes that baked with some chilis, garlic and oil. It’s divine, and just like you, i eat it fast, go for seconds, and clean up every time. Yas I made your dish last night for dinner. YUM! Thanks for the inspiration! nice! i’m glad you enjoyed it! simple pastas are the best–but i don’t have to tell you that.